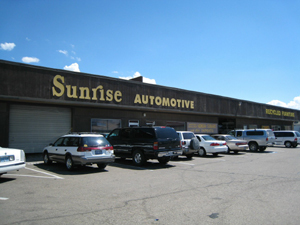 At Sunrise Automotive we specialize in Honda, Subaru, and Toyota. We also do general repairs on most other Japanese cars. Sunrise has been in business in Carson City for the last 29 years. Our friendly and professional staff of ASE-Certified technicians use some of the latest tools of the trade to stay on top of today's ever-changing automotive technology, such as Alldata Automotive Information Service, which provides the most up-to-date factory information, service bulletins and repair procedures. We can perform factory-scheduled maintenance, such as oil changes, tune-ups, etc., to maintain your car's warranty, and keep the car in the best possible shape. Should your vehicle ever need more extensive repairs such as powertrain, chassis or electrical, we handle it all. We have a large, clean facility with multiple service bays. Our ASE-certified technicians use the latest diagnostic equipment to provide you, the customer, with the most efficient, accurate and cost-effective service experience. Monday through Friday - 7:30 a.m. to 5:30 p.m.